IHG® Rewards Club - eBook - Q or not Q? The study analyses the current state of research on the synoptic problem and proves that the Synoptic Gospels were written in the Mark, Luke, Matthew order of direct literary dependence. Moreover, the work demonstrates that the Synoptic Gospels are results of systematic, sequential, hypertextual reworking of the contents of the Pauline letters. 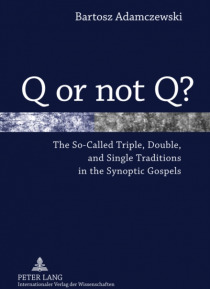 Accordingly, the so-called 'Q source' turns out to be… an invention of nineteenth-century scholars with their Romantic hermeneutic presuppositions. Demonstration of the fact that the Gospels are not records of the activity of the historical Jesus but that they narratively illustrate the identity of Christ as it has been revealed in the person and life of Paul the Apostle will certainly have major consequences for the whole Christian theology.